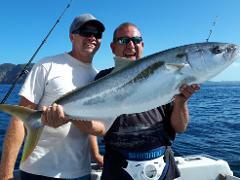 Catch a Kingfish with us! If you’ve never felt the strong pull of a kingfish on your line, then you’re definitely missing out! We specialise in big game fish and kingfish fishing charters, giving our customers the thrill of the hunt that only kingfish can provide. Yellowtail Kingfish are mostly found in the water column (semi-pelagic) at depths of up to 200 metres, and are most abundant in the northern half of the North Island. They’re usually found in open coastal waters, as they like the high currents or tidal flows near rocky outcrops, reefs and pinnacles. We often find them hanging around in areas with open sandy bottoms and in shallow enclosed bays – which there are plenty of around here. Yellowtail Kingfish are a highly prized gamefish, for which New Zealand currently holds the most International Game Fish Association (IGFA) world records. The minimum size regulations are 75cm, with a daily bag limit of three per day. It usually takes a Kingfish up to 21 years to reach its full growth size of 2.5 metres. They’re a seriously strong fighting fish, so if you do manage to hook up a full sized adult, you’ll know all about it! Different methods are used to catch the hard fighting kingfish, such as live baiting, jigging, dead baits, stick baits and strip baits. 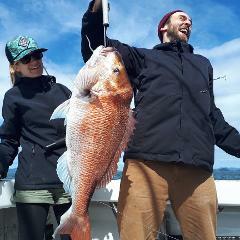 They are one of the most popular fish to catch in the Bay of Islands area. The Yellowtail Kingfish is renowned for their fighting attitude, big screaming runs and their ability to find that big rock to bust the line and regain their freedom. 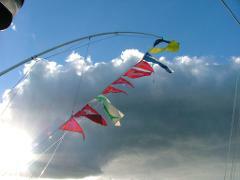 These powerful fish are a fisherman’s dream, because each fish can teach you a new fishing lesson. Whether it’s just a small fish in very shallow water or a big kingfish that grabs a stick bait, their bite can be super gentle or a heart pounding smash. There is always great anticipation on waiting for a kingfish to bite your line!